I love how all the different patterns and textures go so well together. Great outfit! Awesome outfit, your skirt is so pretty. Ooo I love all the mix of textures and the vans are such a cool touch! Perfect. Such a great look! Loving that bag! You look so absolutely stunning! Great look and great bag!!! Great look, Ioving the skirt and the bag! Your bag is amazing! Loving those pure white slips on too! Happy friday girlie! P.S. think you would adore the Feeling Tribal outfit post we shared on the blog today! That skirt is so interesting! I love it! Definitely Cozy and Chic! Well done as always. It's so true! White sneaker do something to an outfit to make it look so street style cool! Oh gosh that pop of blue on the bag is the icing on the cake. I usually always stick with black bags, but that's making me change my mind! Love how laid back, but up scale this look is thanks to different patterns and color palette you chose! Love how you mixed different textures in this look! And that bag is gorgeous! I'm absolutely in love with your bag, it's fabulous! Such a cute outfit. Chic skirt! It has such a unique design. Love how you style it overall, especially the blue purse - brightens up this cold chilly season. 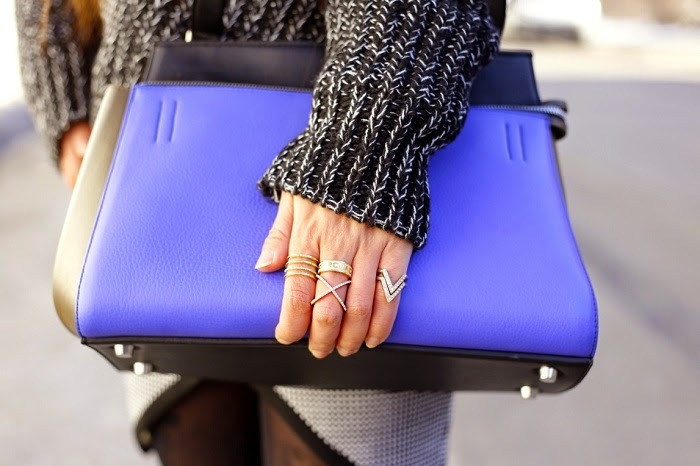 What a gorgeous Celine bag, and I love all those rings pried together! Gorgeous look and loving the electric blue of that bag. I have the navy one but I'm wishing I got a bright colour now! I love this outfit! Love how you wore slip ons! I can never keep white shoes white!! love this outfit! Loving that sweater on you! I love all of those rings together! I love the bag... super bold and stylish!